Over the past six years, organizations in every part of the country -- in Miami and Chicago, in Washington and Philadelphia, Detroit and New York -- have sponsored lectures, exhibits, plays, films, and other special programs in May to acknowledge the achievements of American Jews in fields ranging from sports and arts and entertainment to medicine, business, science, government, and military service. Several of this year’s events connect to the Jewish Women’s Archive. For example, the Virginia Holocaust Museum in Richmond is unveiling the Jewish-American Hall of Fame plaque honoring Dr. Gertrude Elion (1918-99), Nobel Prize Winner in Medicine and one of JWA’s “Women of Valor,” who developed the first chemotherapy for childhood leukemia. On May 23rd, in Philadelphia, filmmaker Aviva Kempner will share her latest work-in-progress, a documentary exploring the story of Julius Rosenwald, the son of German-Jewish immigrants who co-founded and was chair of Sears, Roebuck & Co, becoming one of the wealthiest men in America as well as an influential philanthropist. As its contribution to JAHM in 2012, the Jewish Women’s Archive is making available clips, as well as the full video and transcripts of interviews with Aviva Kemper and eight other Jewish women from the Washington, D.C. area. 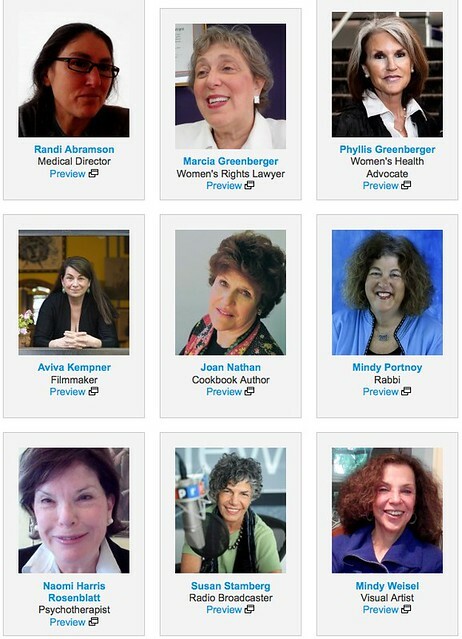 As physicians and lawyers, advocates and artists, rabbis and writers, the nine women interviewed by Deborah Ross evidence what President Obama called the “spirit found in the countless Jewish Americans who, through their every day actions, work to provide a better life for future generations.” JWA salutes them. Visit the Weaving Women's Words: Washington D.C. Stories exhibit to explore the newly-available video oral histories of the nine women below. Rothman, Ellen K.. "JWA releases "D.C. Stories": A new oral history exhibit for Jewish American Heritage Month." 2 May 2012. Jewish Women's Archive. (Viewed on April 18, 2019) <https://jwa.org/blog/jwa-releases-dc-stories-new-oral-history-exhibit-for-jewish-american-heritage-month>. Logo for the designation of May as Jewish American Heritage Month.